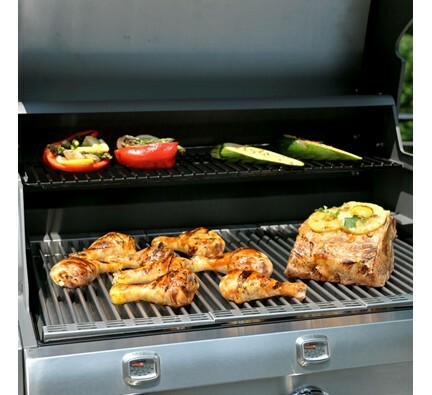 Few things in life are more satisfying than a juicy, succulent piece of meat to go with your side salad and breadsticks. Saber utilizes technology that helps keep your meat moist. 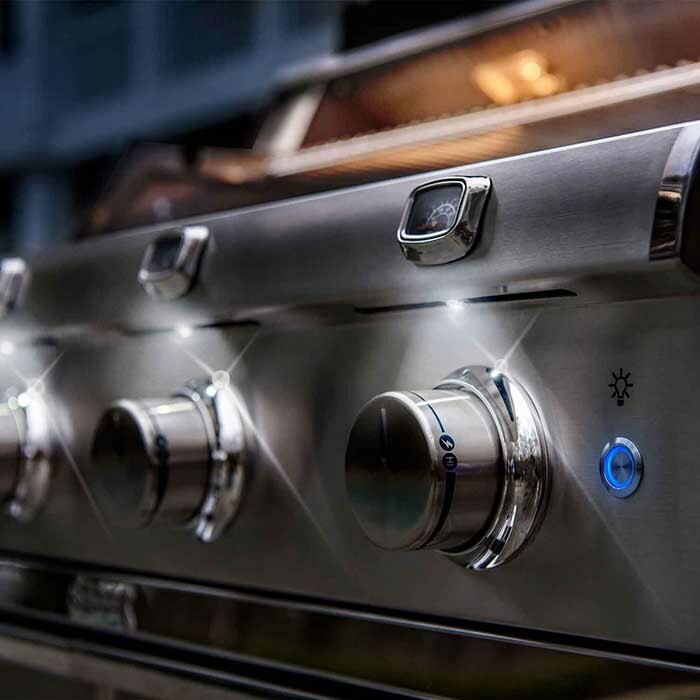 The circular motion that occurs when warm air rises and cooler air drops in standard convection cooking is taken to a new level with infrared technology. 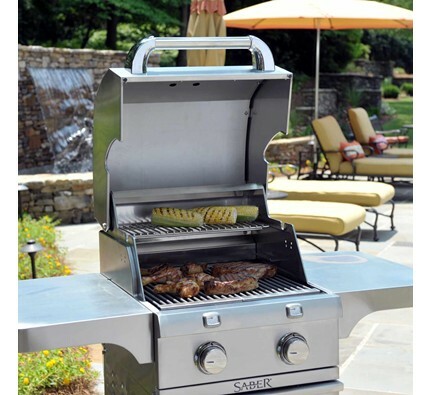 A Better BBQ is as close as Aspen Spas of St. Louis, and Saber has many exciting features to offer. 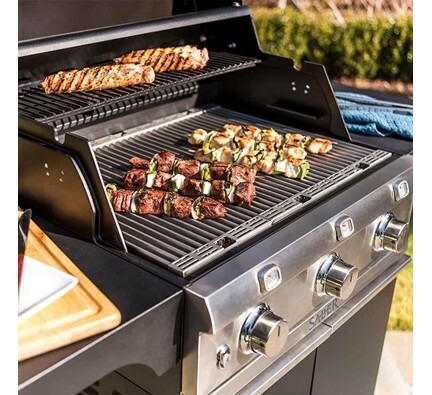 A successful BBQ requires much more than just the meat, and it can be time consuming to constantly be running to and from the kitchen. 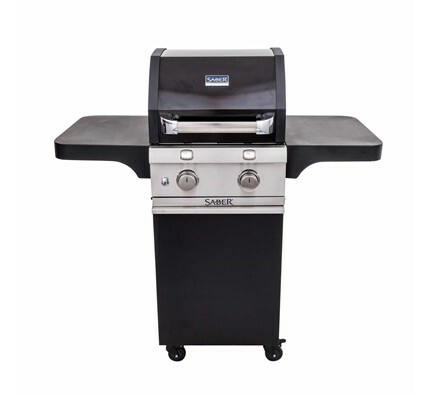 The savvy BBQ master can save time and energy with the Saber grill. 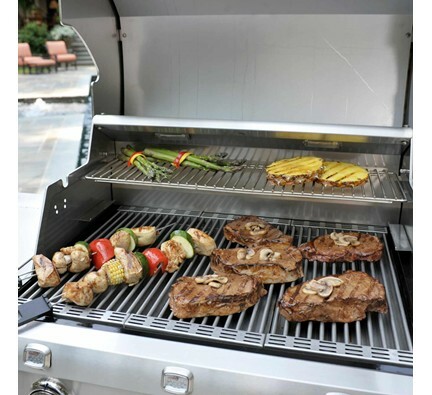 It allows you to cook your entire meal right on the grill. 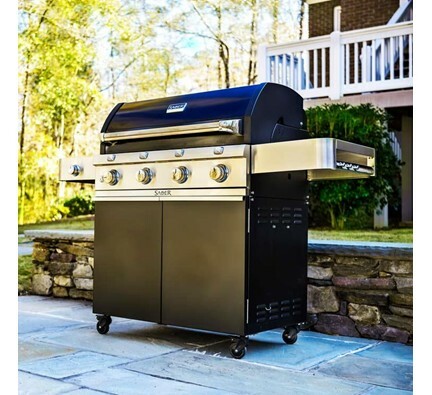 With everything you need in a consolidated space, you’re free to focus all your time on a masterpiece that will have your guests talking. 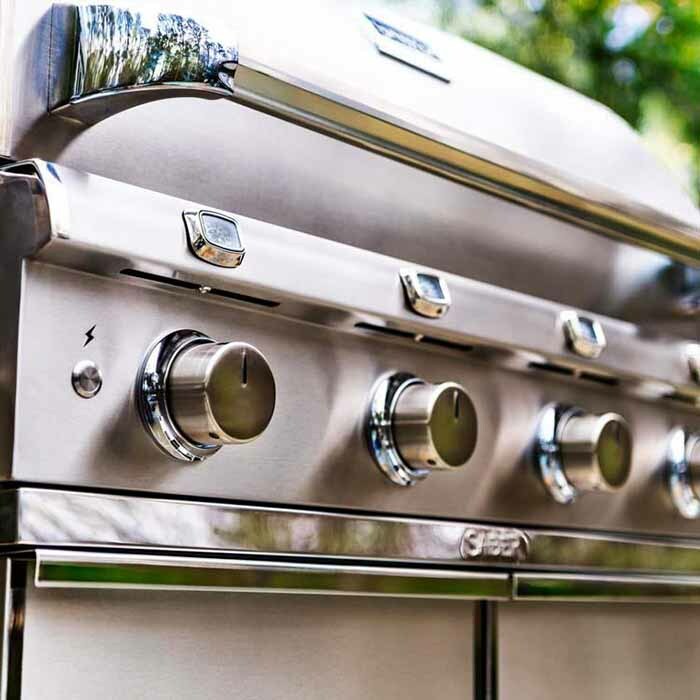 Fuel conversion is a breeze. 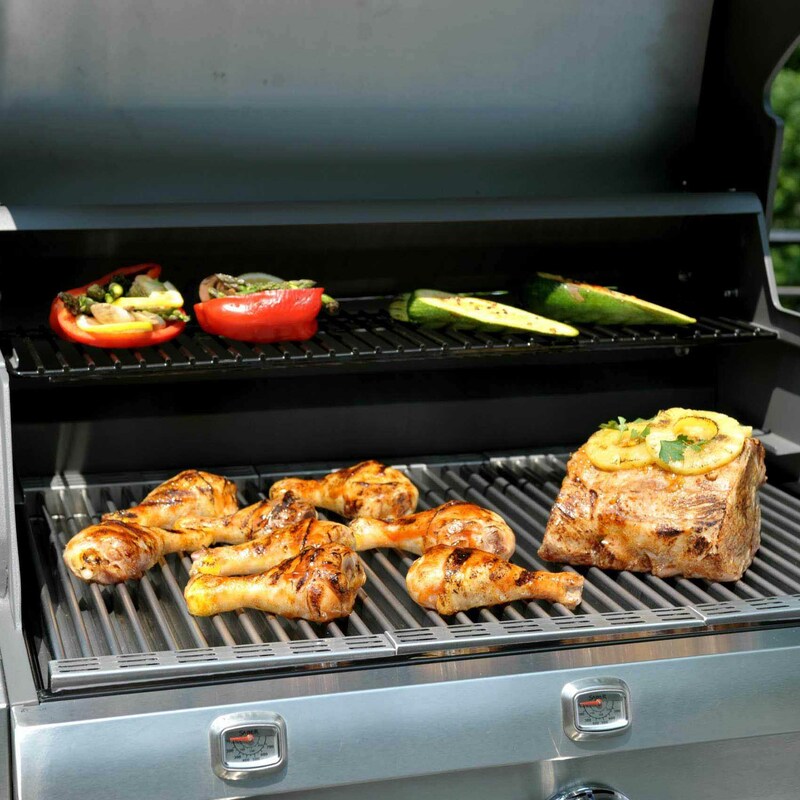 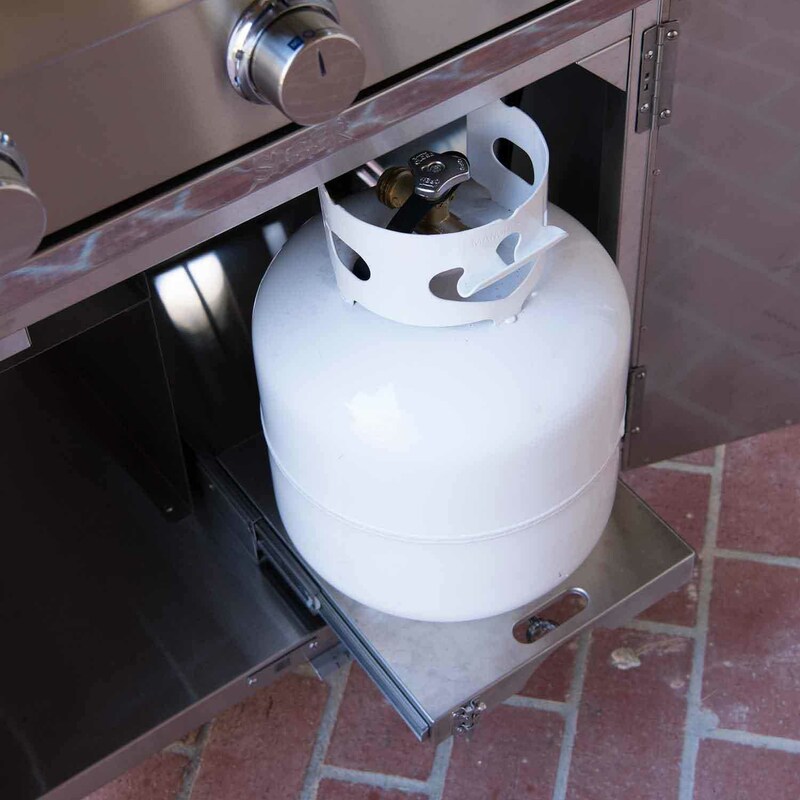 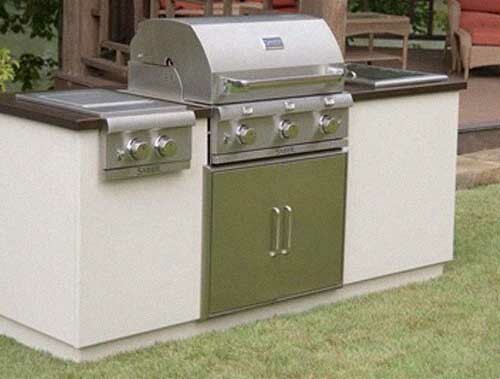 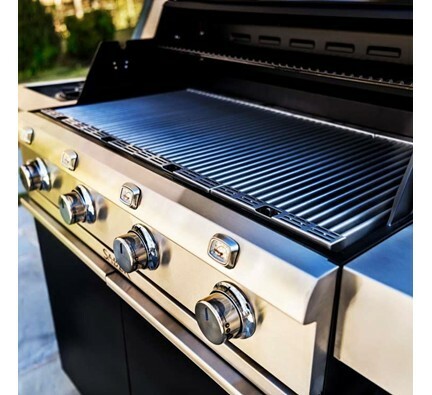 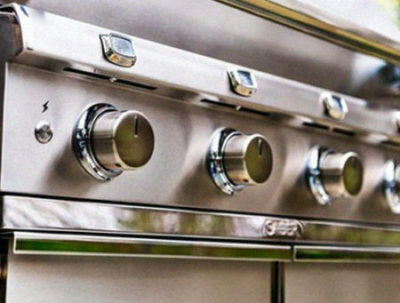 Built-in grills can easily be switched from natural gas to propane. 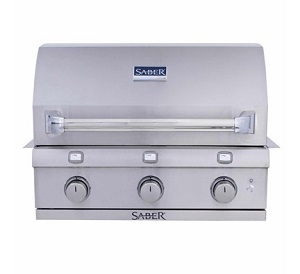 You can also take advantage of Saber’s EZ NG or EZ LP conversion kit, sold separately. 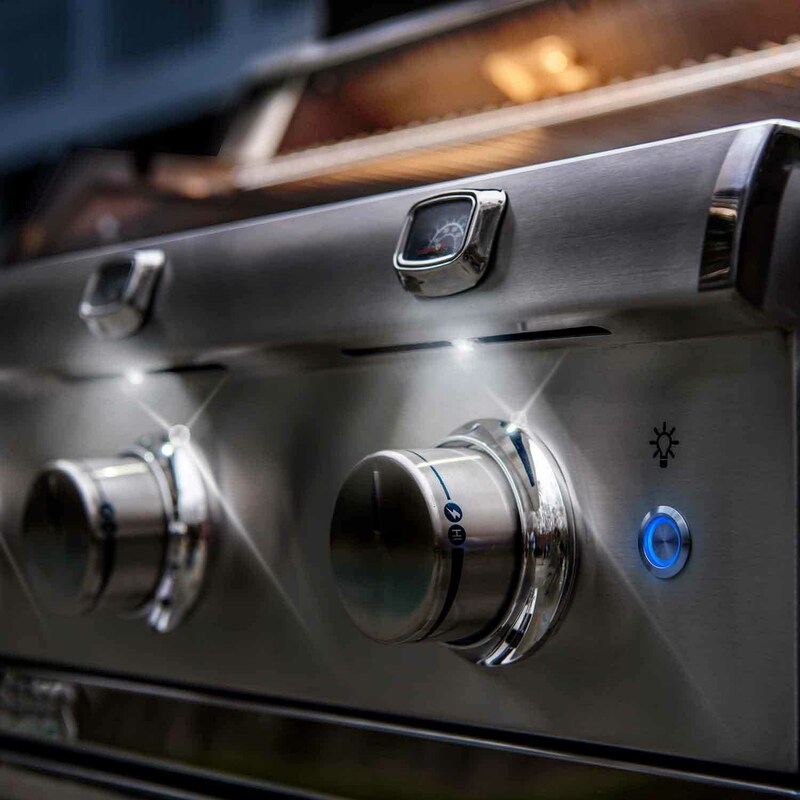 Electronic ignition point at every burner along with a redundant “carry-over” ignition system to ensure safety and reliability. 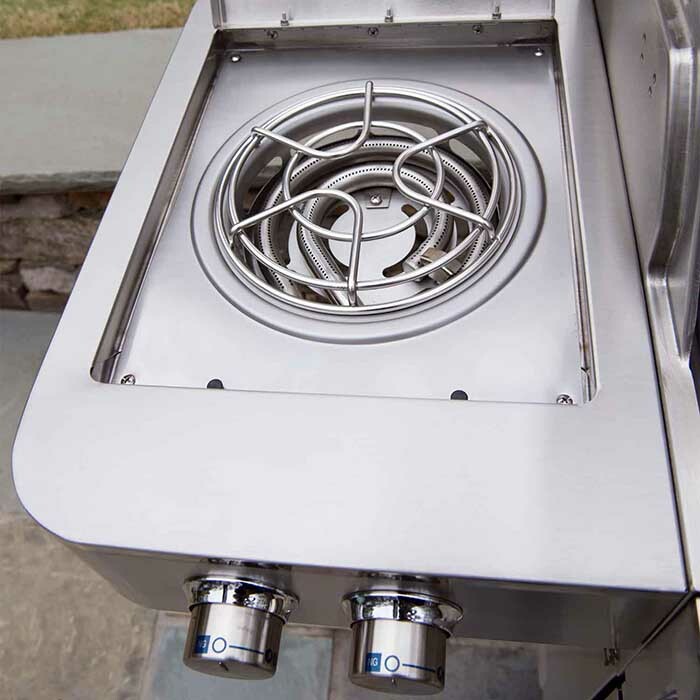 Reduce your carbon footprint by cooking more efficiently using fewer BTU’s. 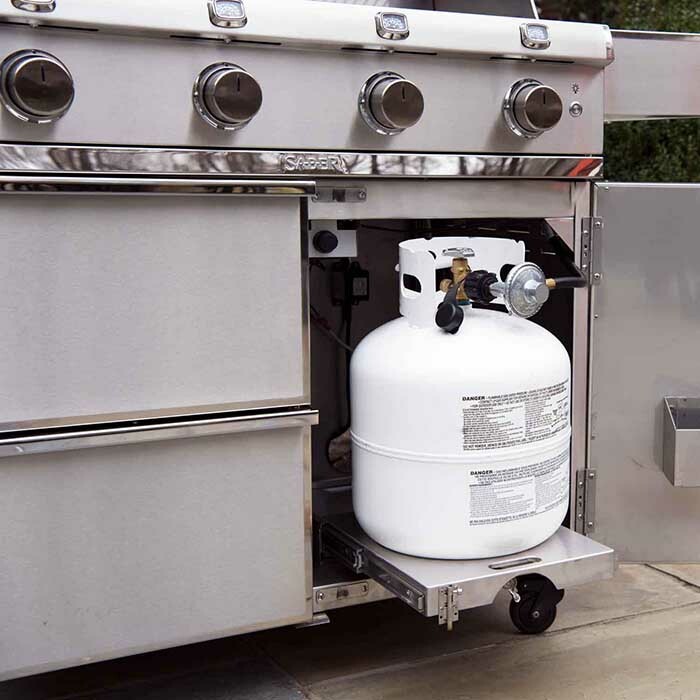 You can reduce gas consumption by up to 30 percent, saving you money and protecting our environment. 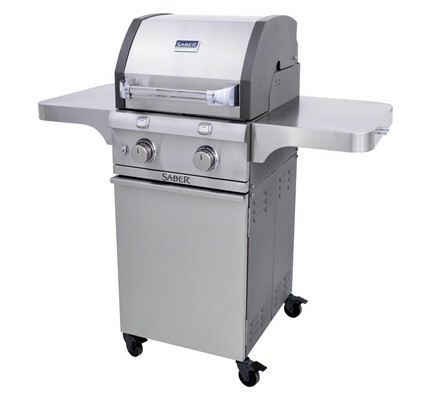 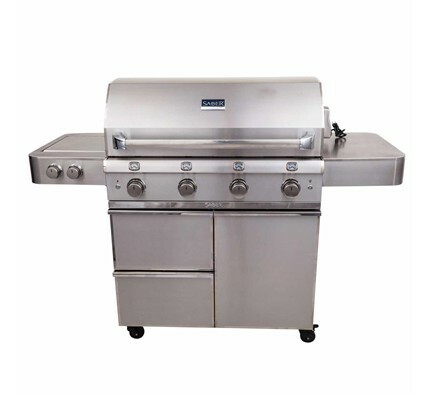 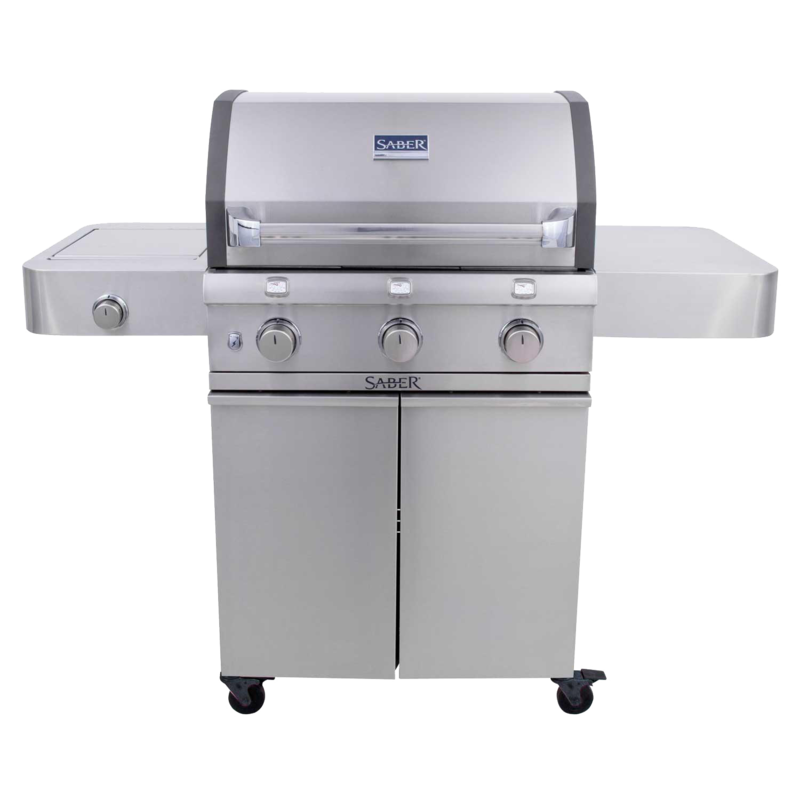 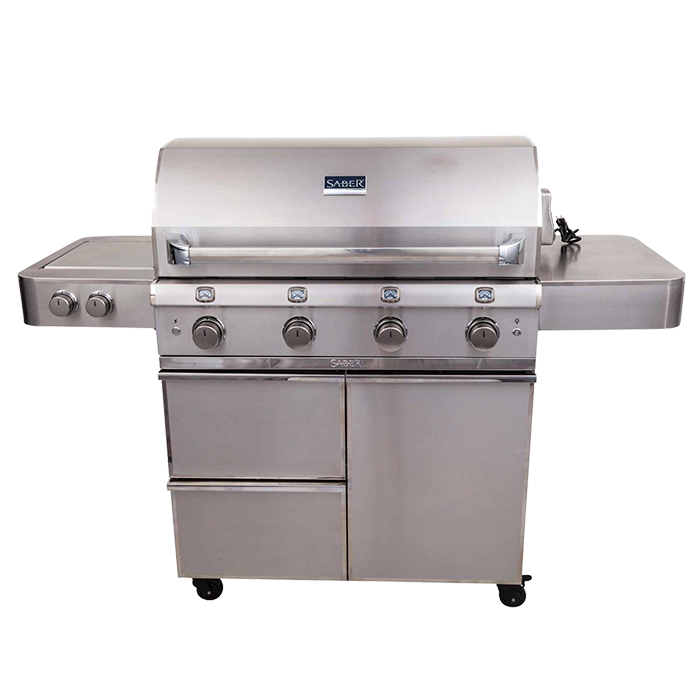 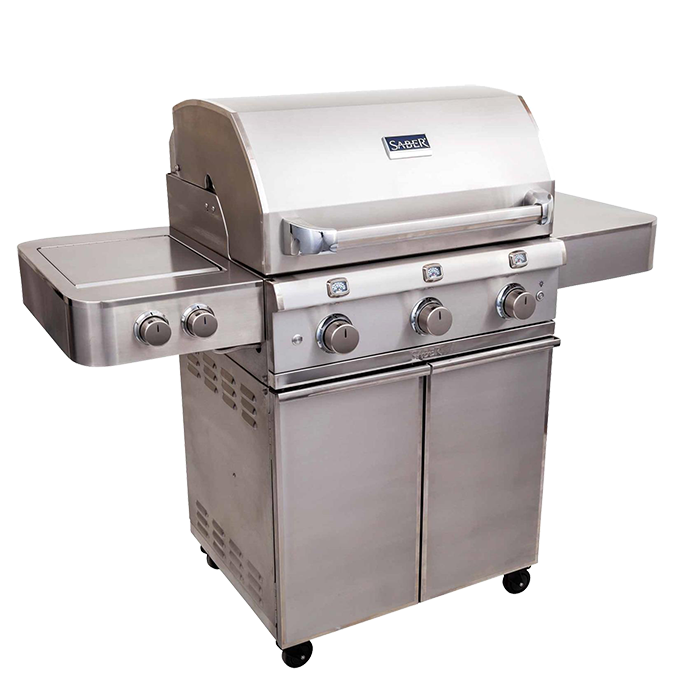 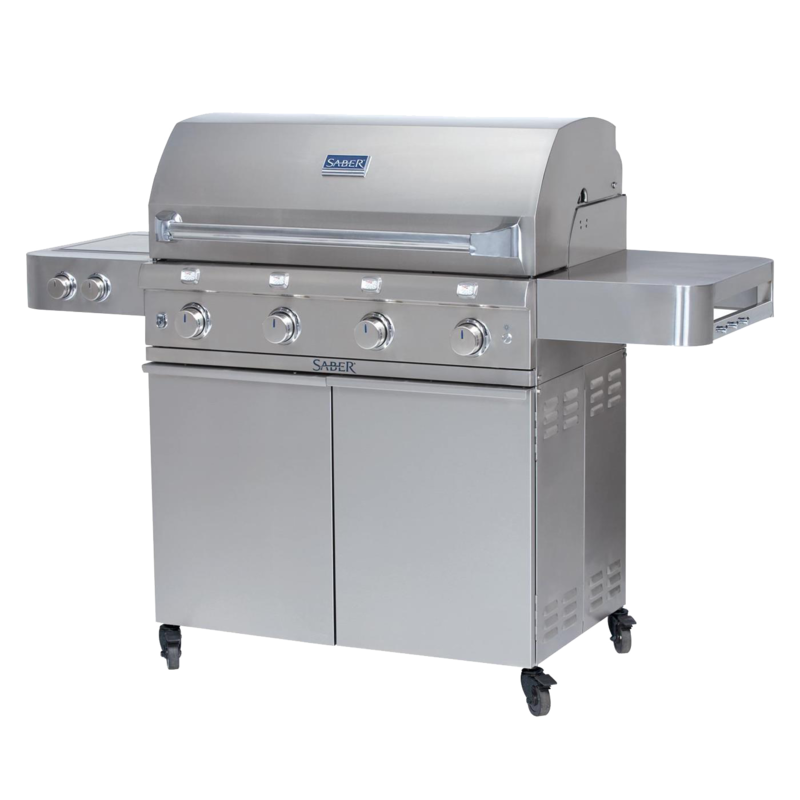 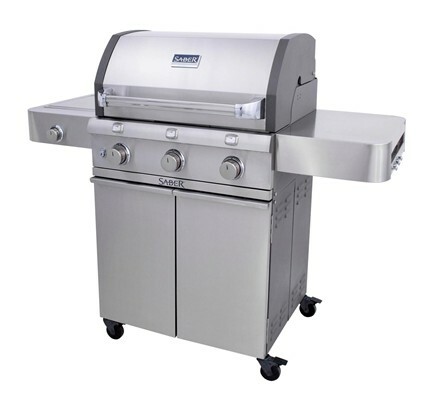 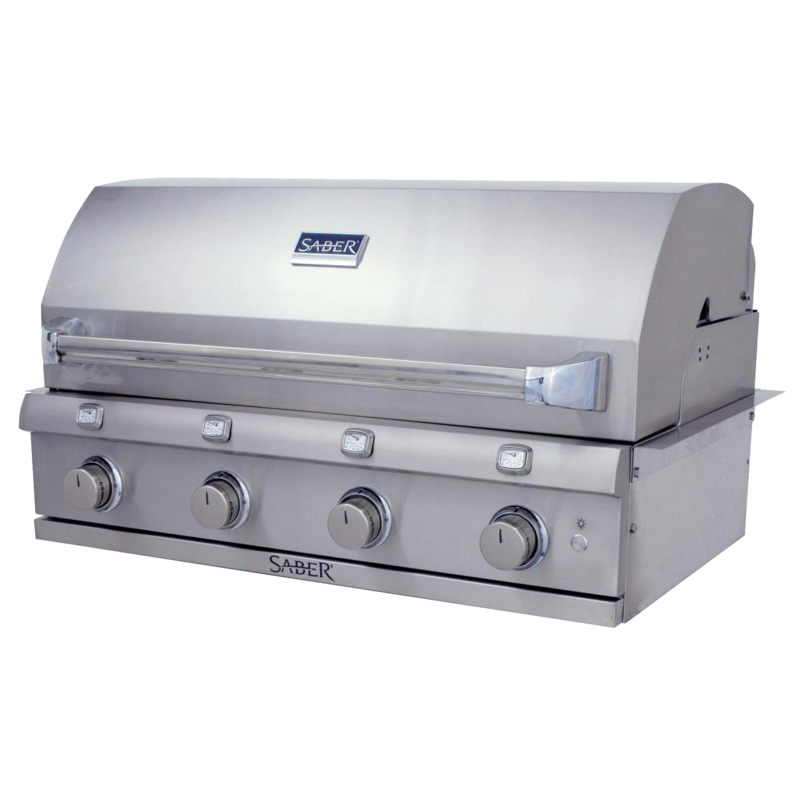 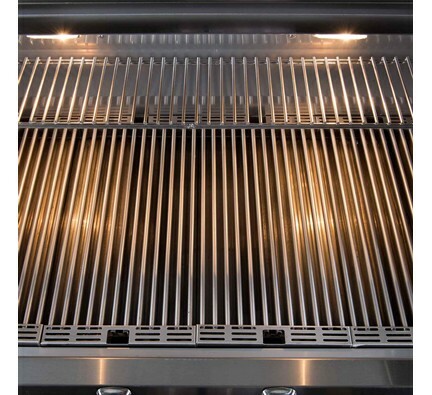 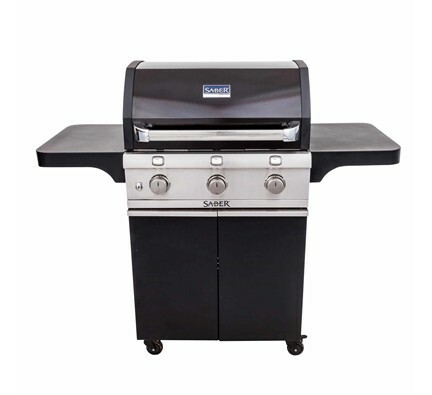 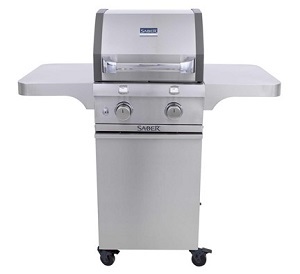 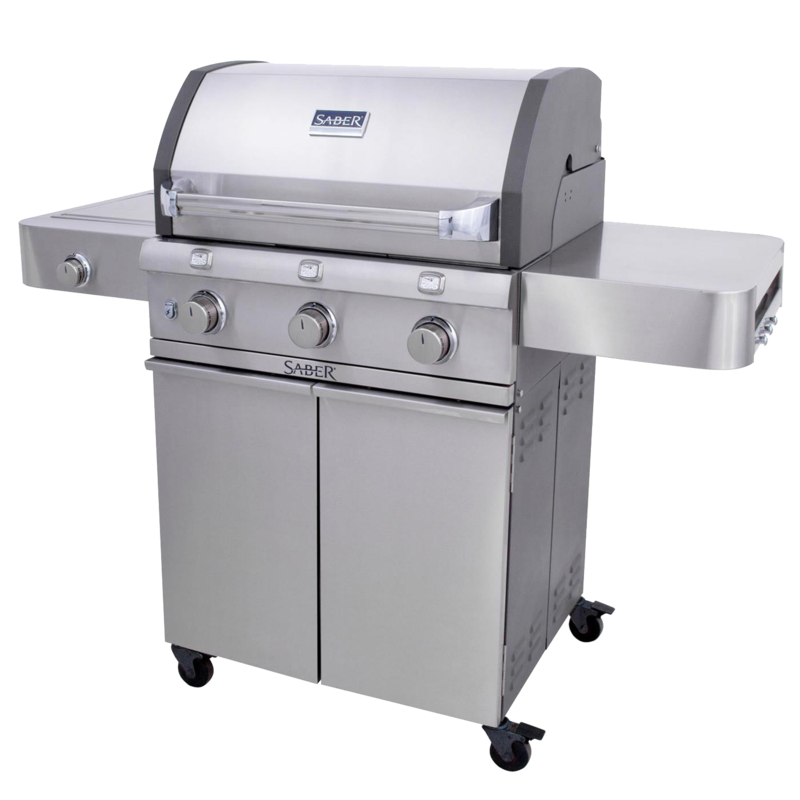 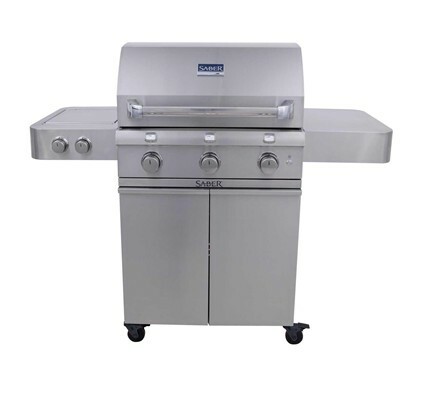 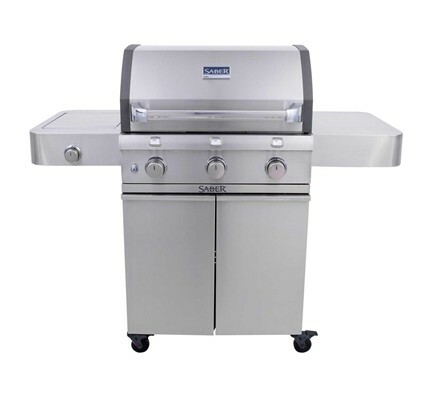 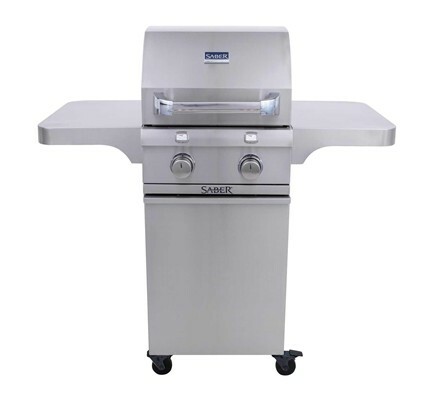 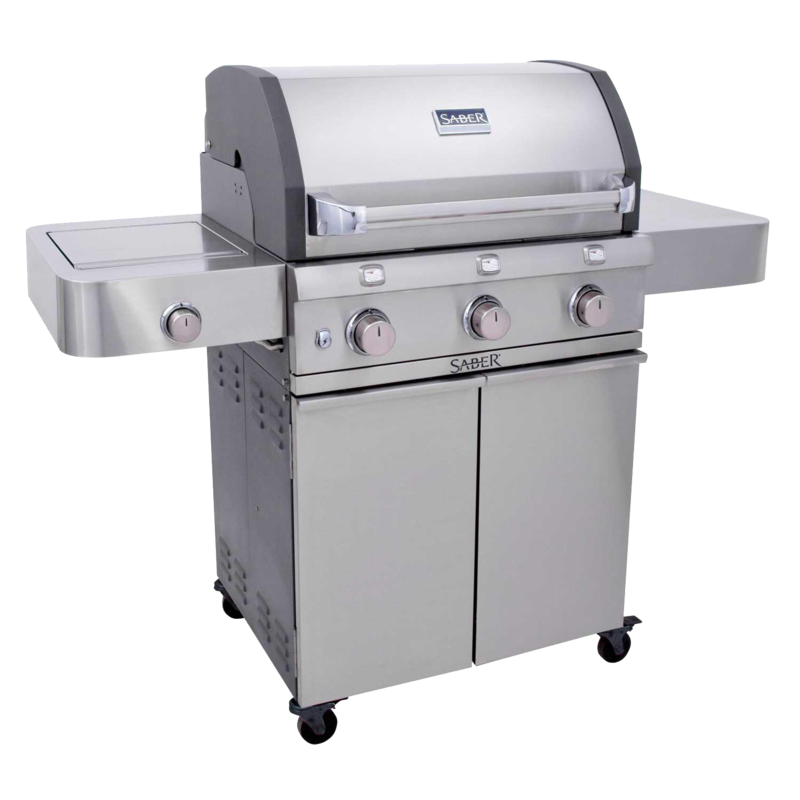 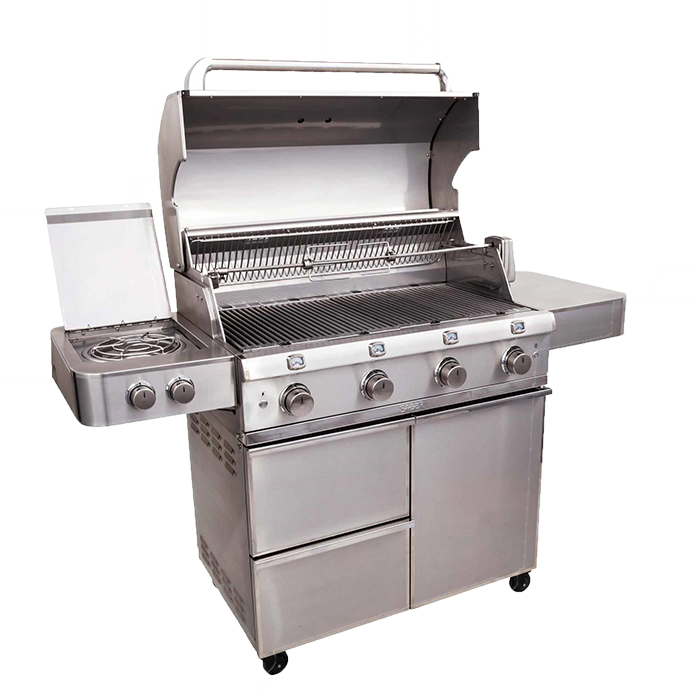 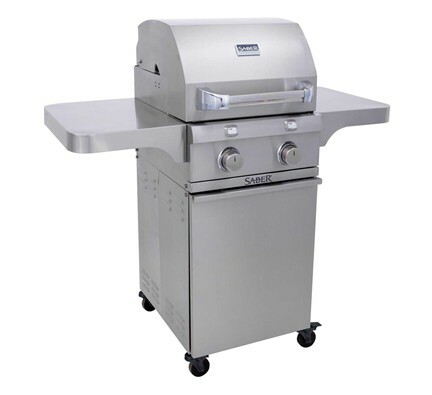 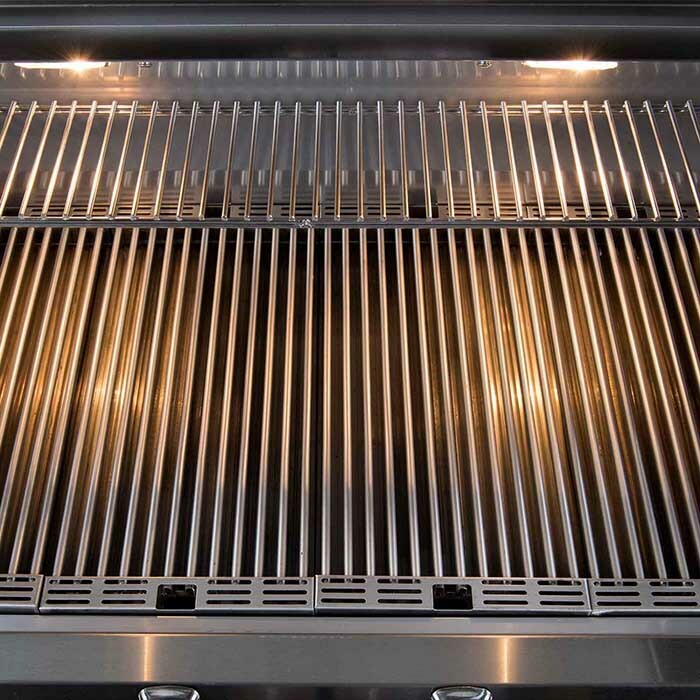 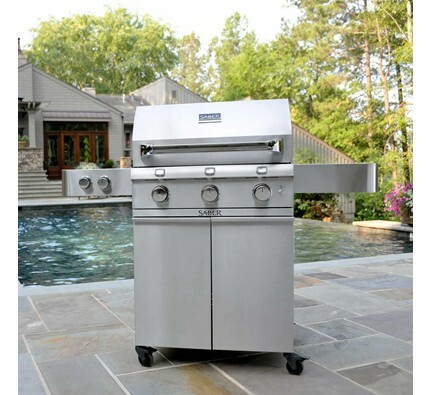 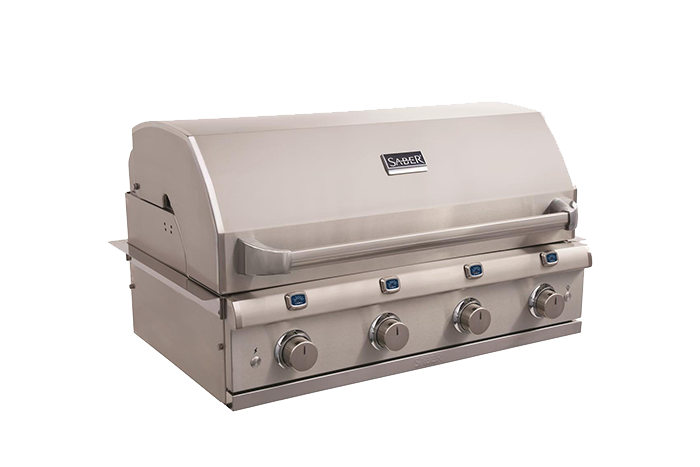 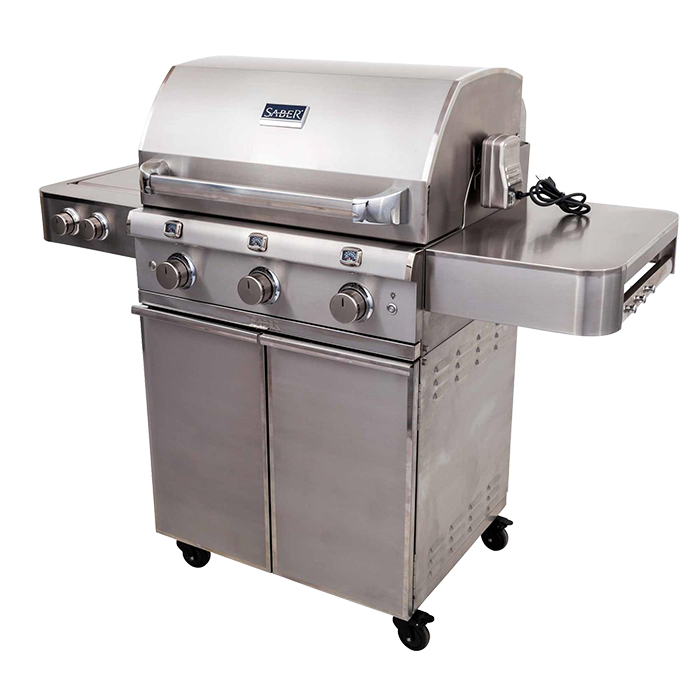 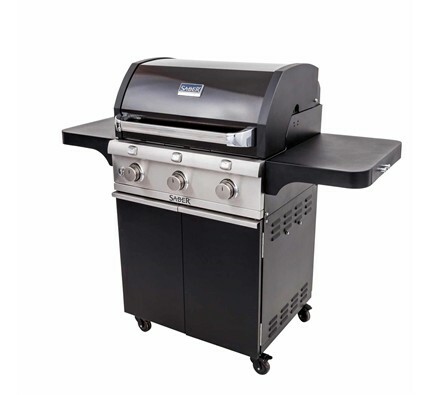 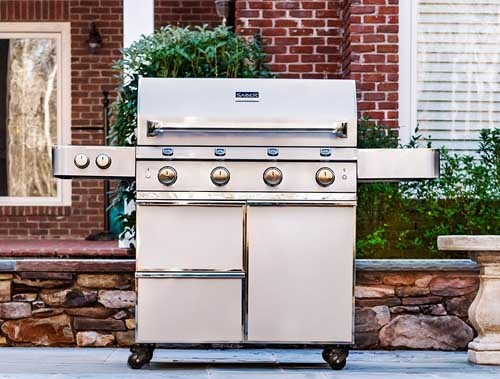 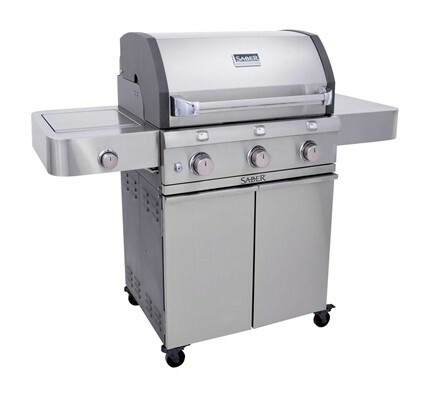 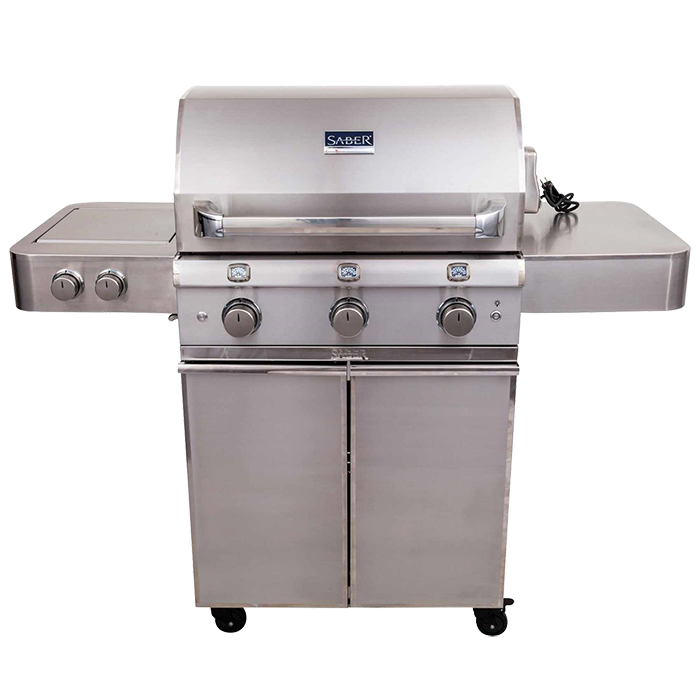 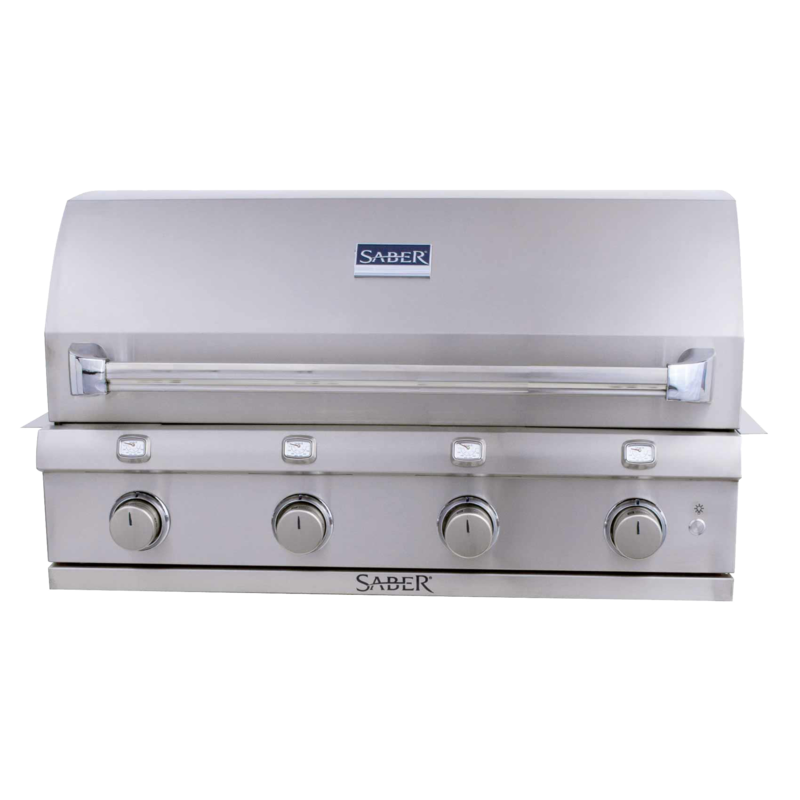 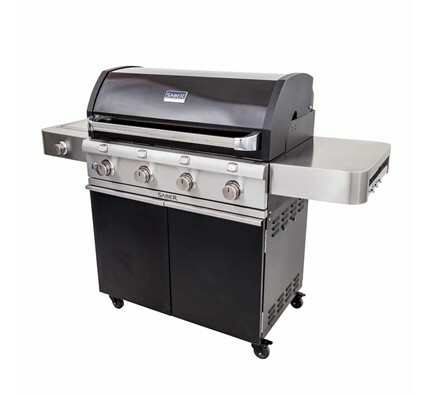 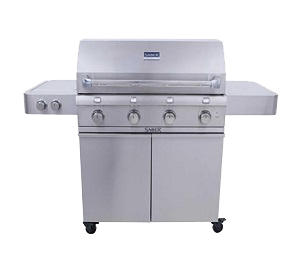 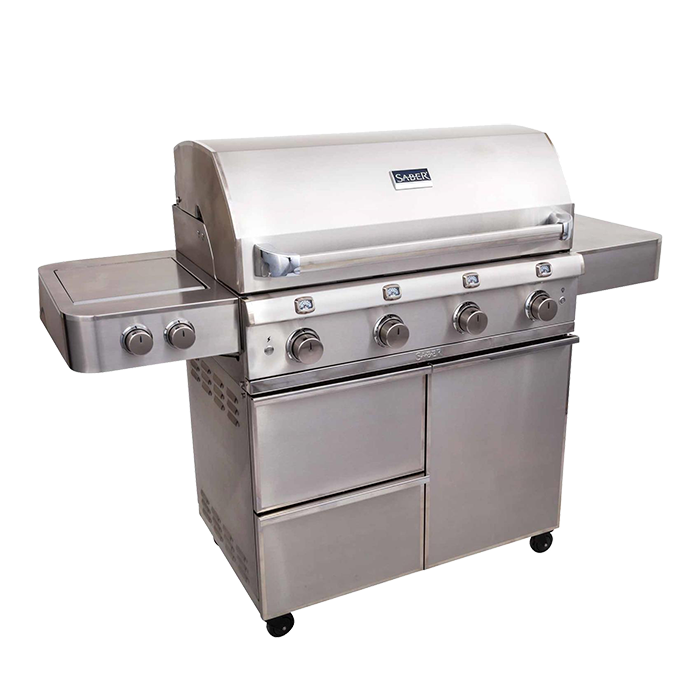 The SABER® Elite Series includes more stainless steel and features to the already great line of SABER® grills. 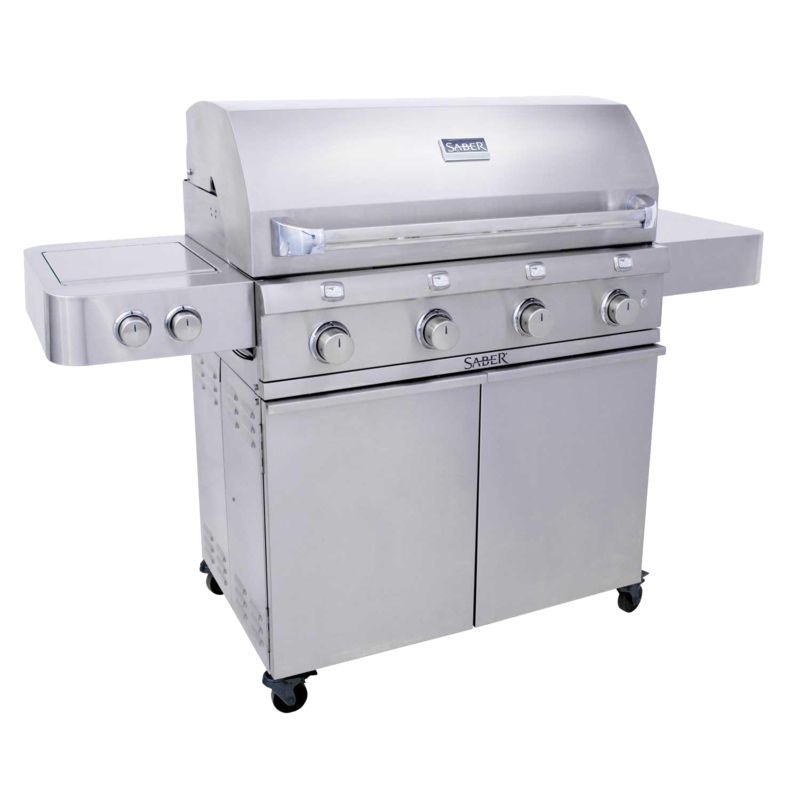 The Elite Series includes mirror-polish edges and bright annealed stainless steel, creating the look of luxury and style. 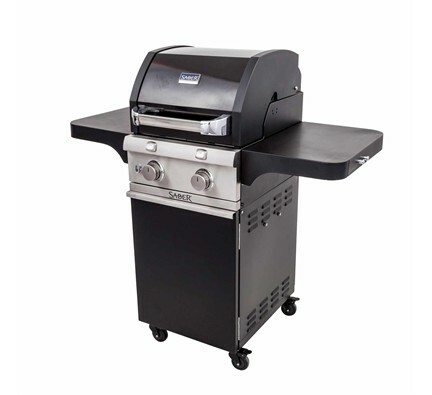 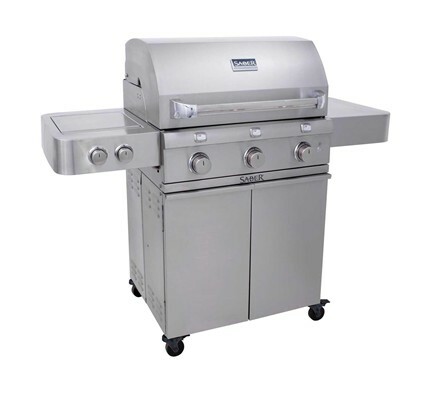 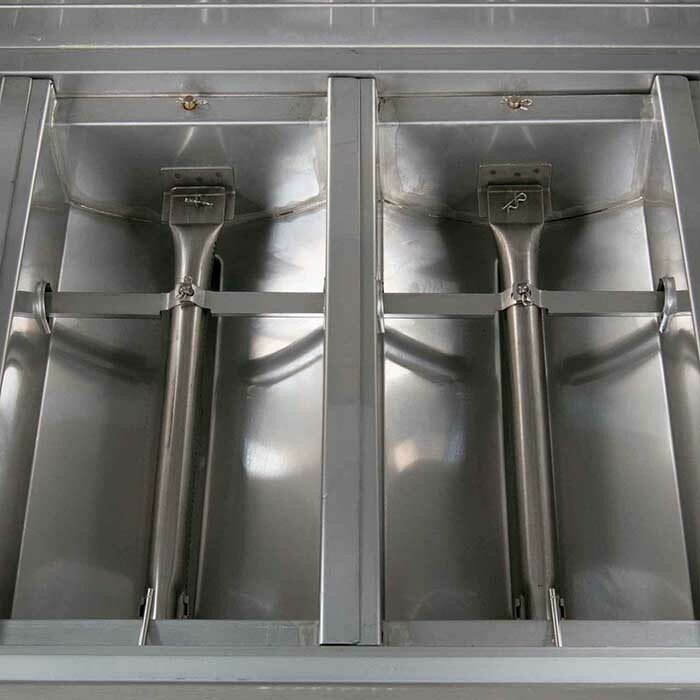 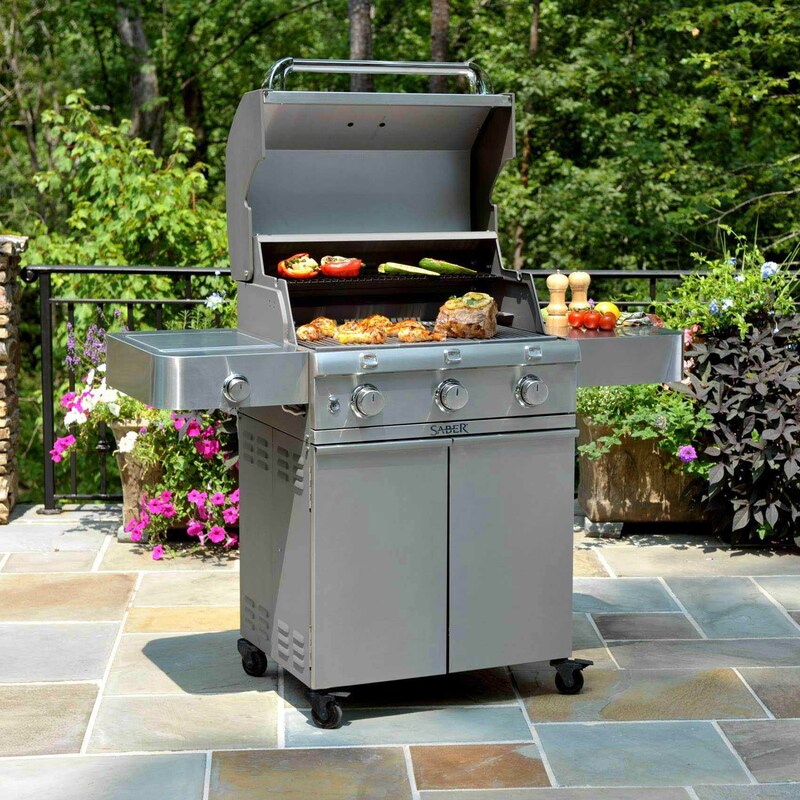 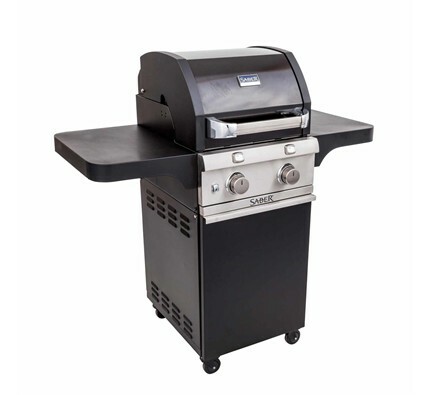 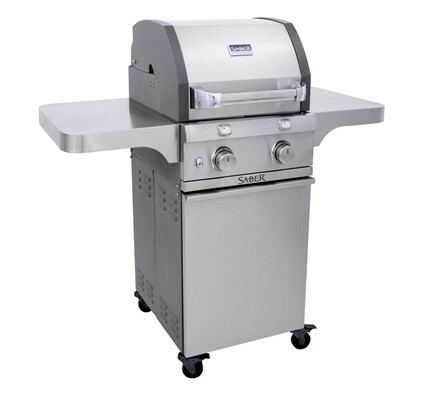 The Elite grills feature LED lighting over the knobs, a stainless tank tray that pulls out for easy access and a stainless condiment basket inside the cart. 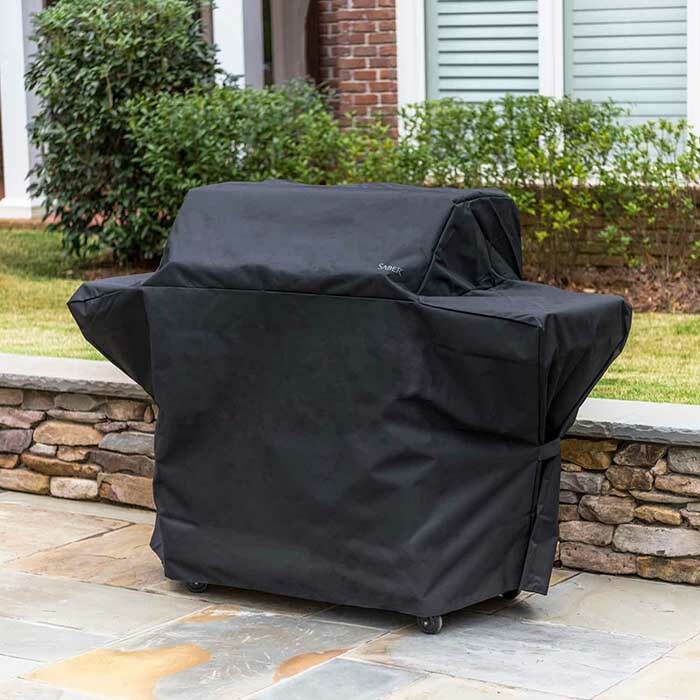 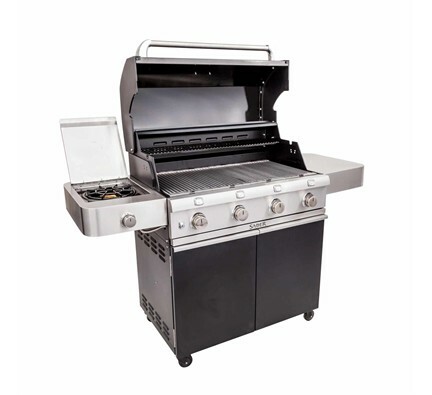 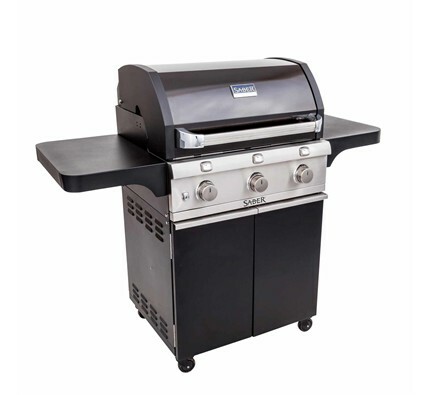 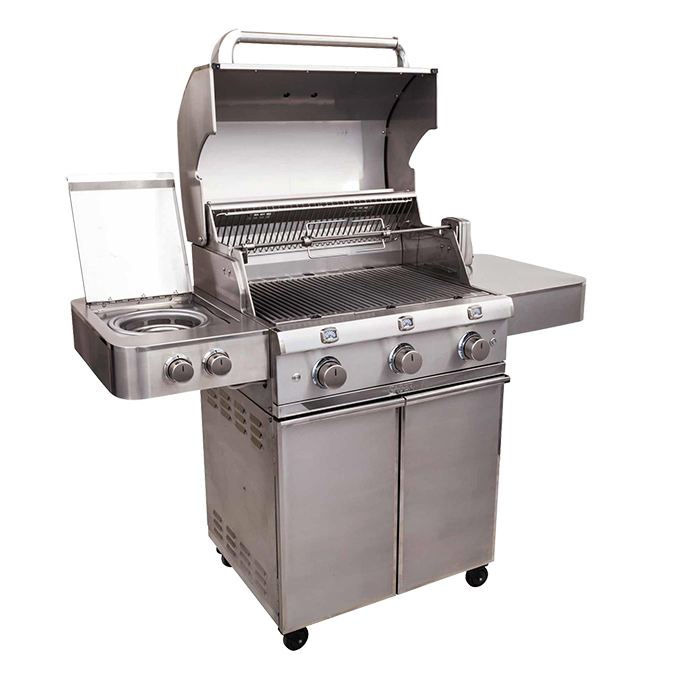 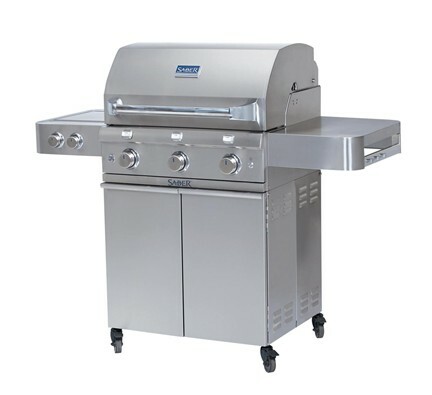 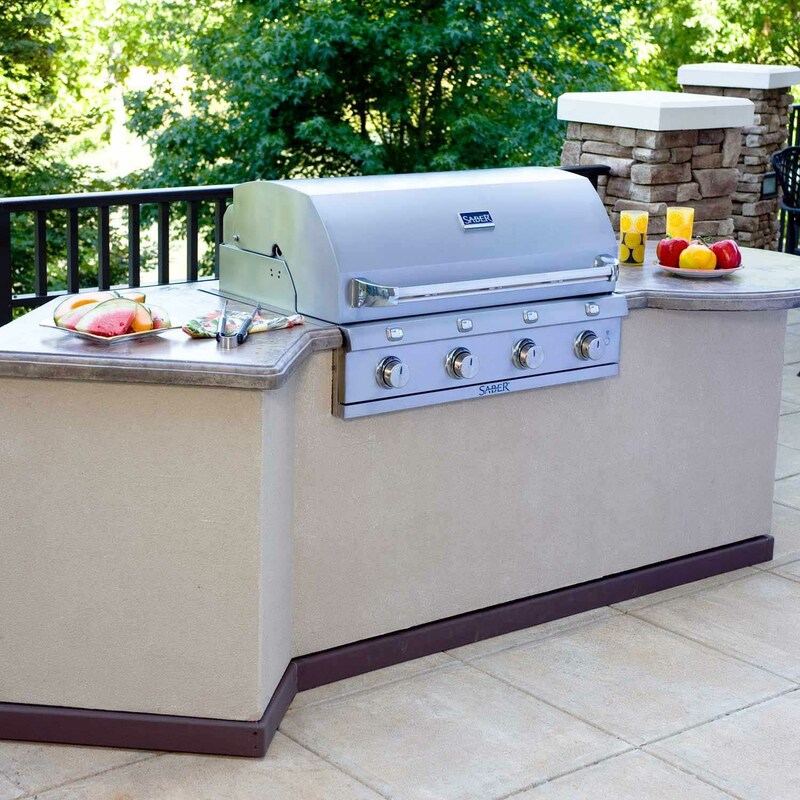 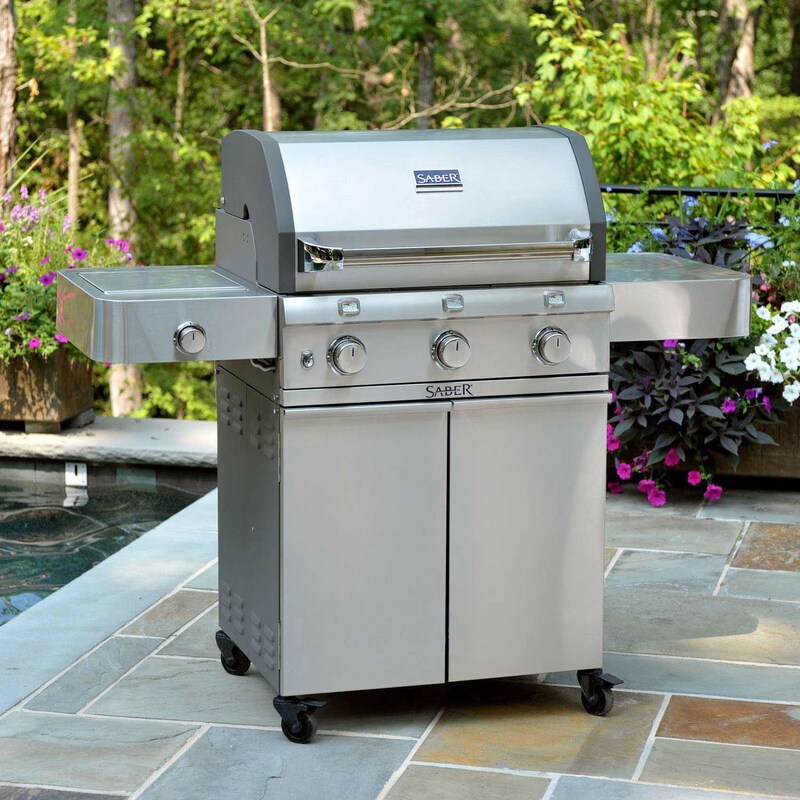 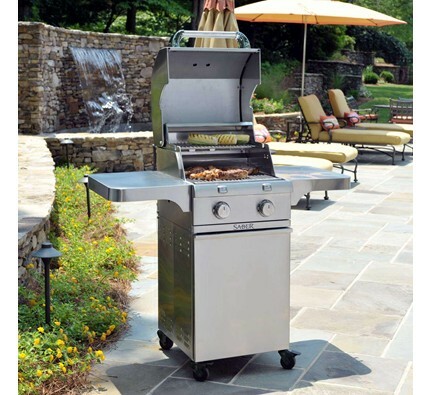 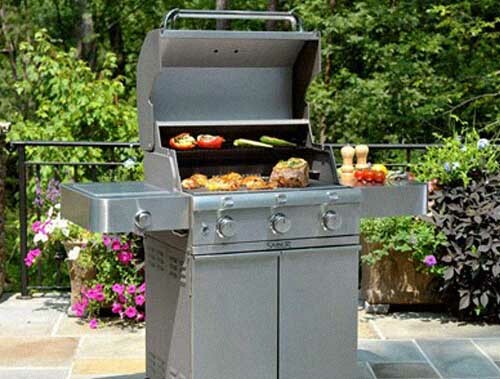 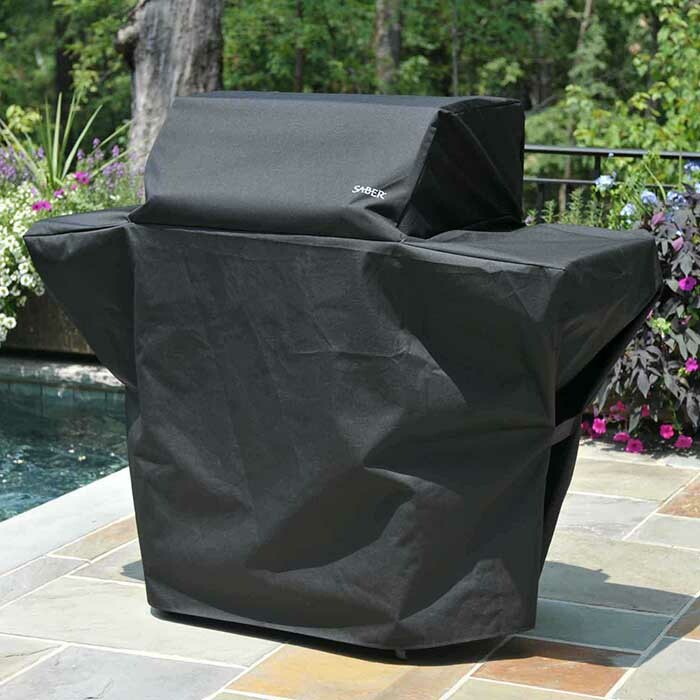 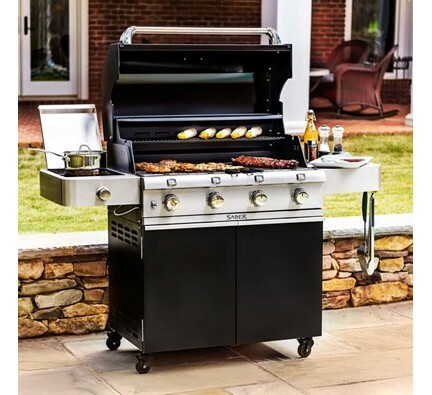 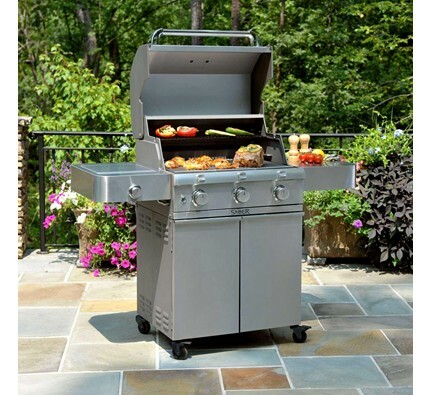 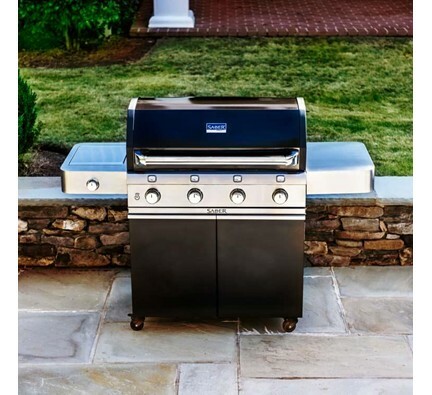 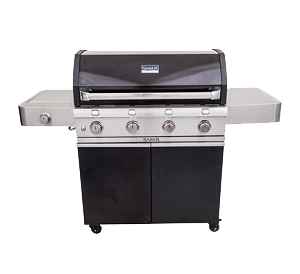 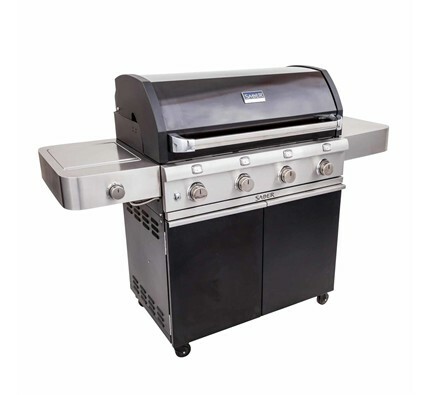 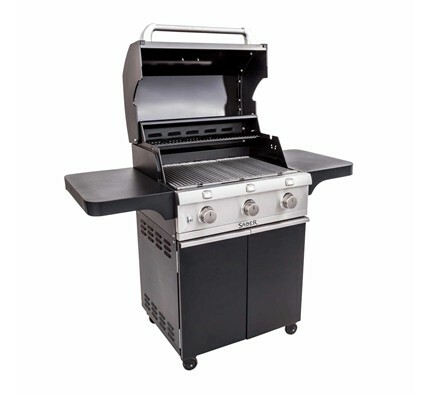 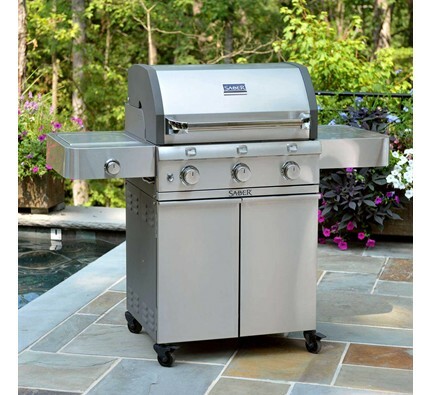 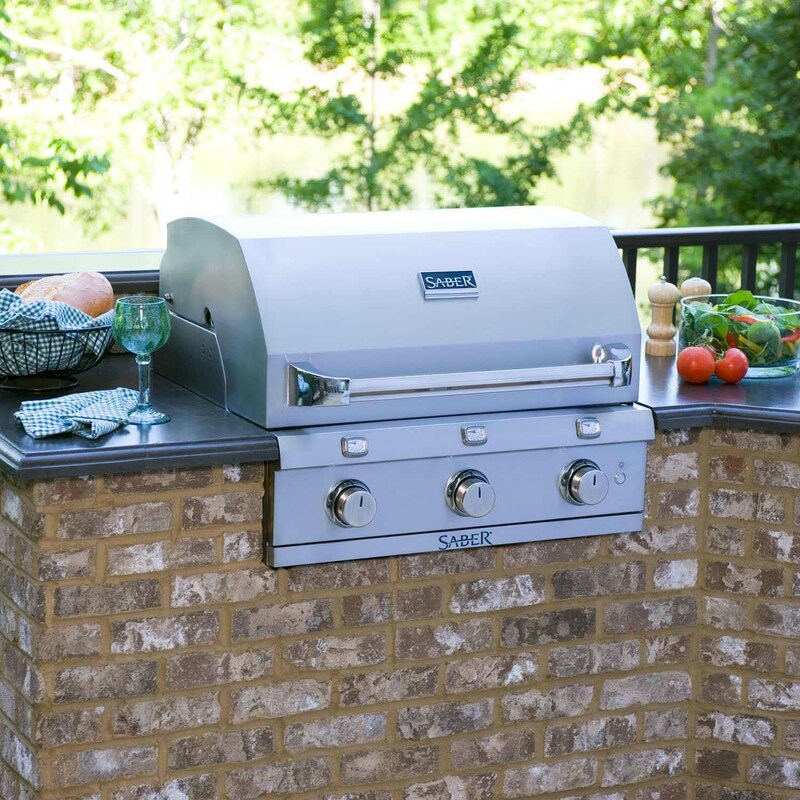 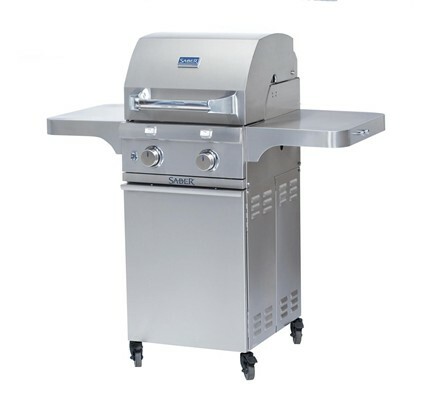 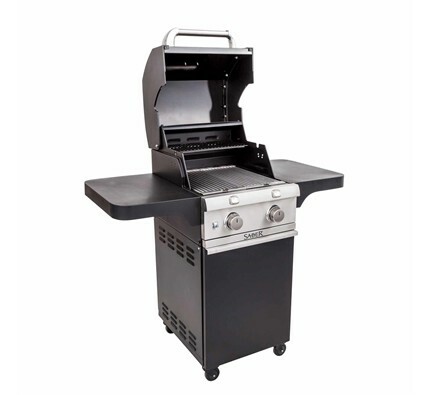 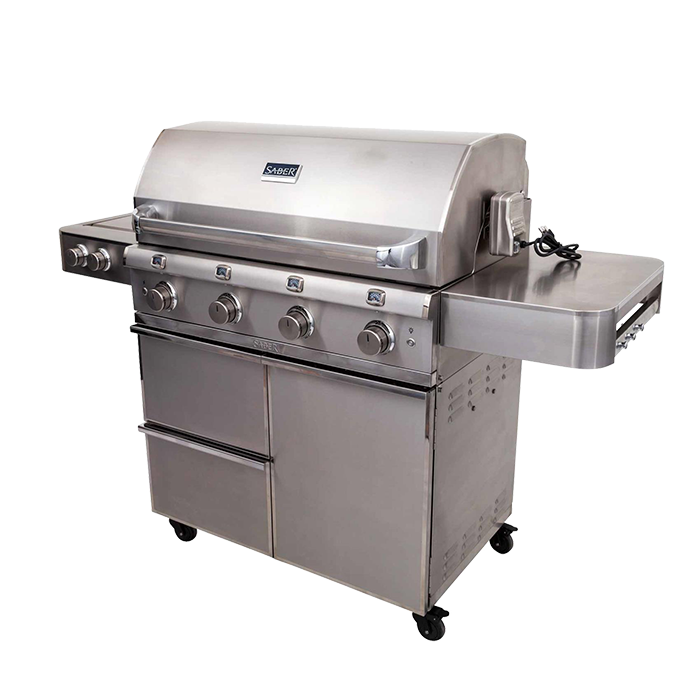 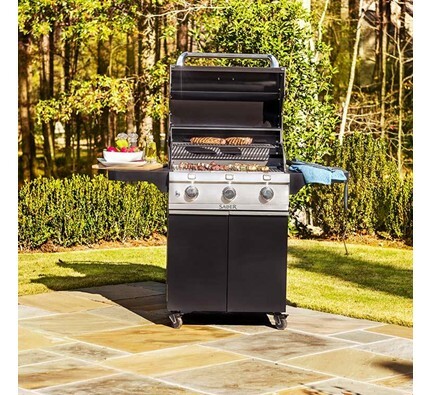 Each Elite grill includes a rotisserie rod and kit and a marine-grade grill cover. 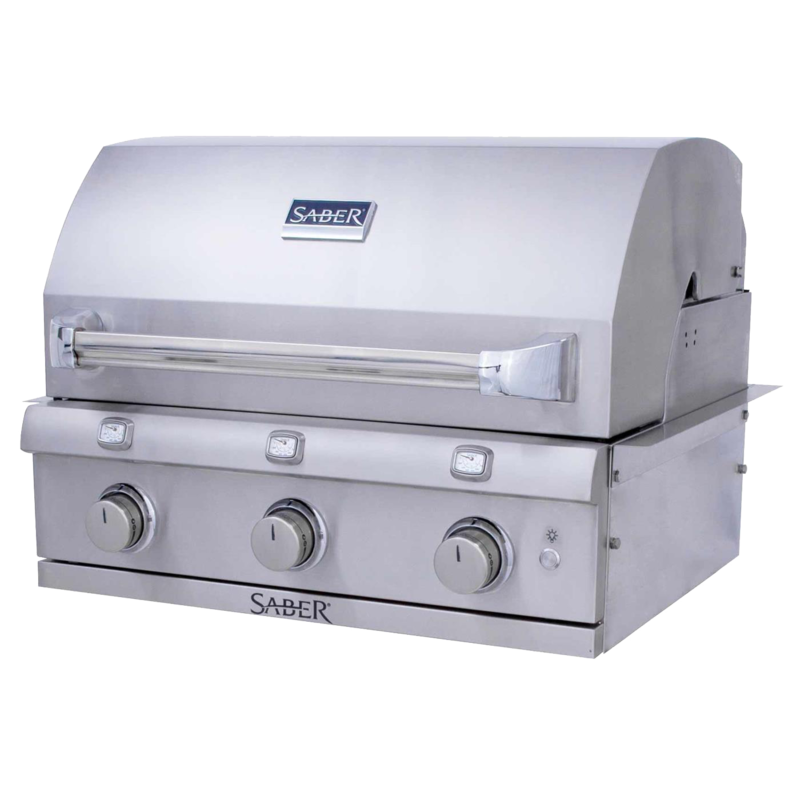 Like every SABER grill, this full-featured model has our advanced infrared cooking system, quality construction, premium materials and unparalleled performance. 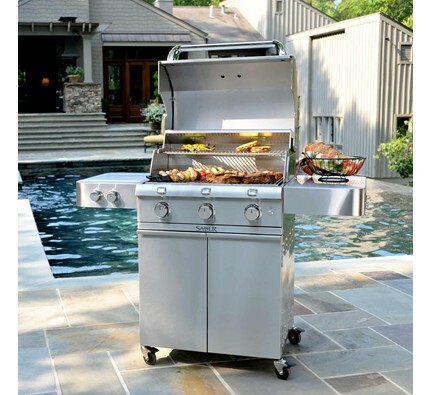 Its space-conscious design is perfect for smaller outdoor areas. 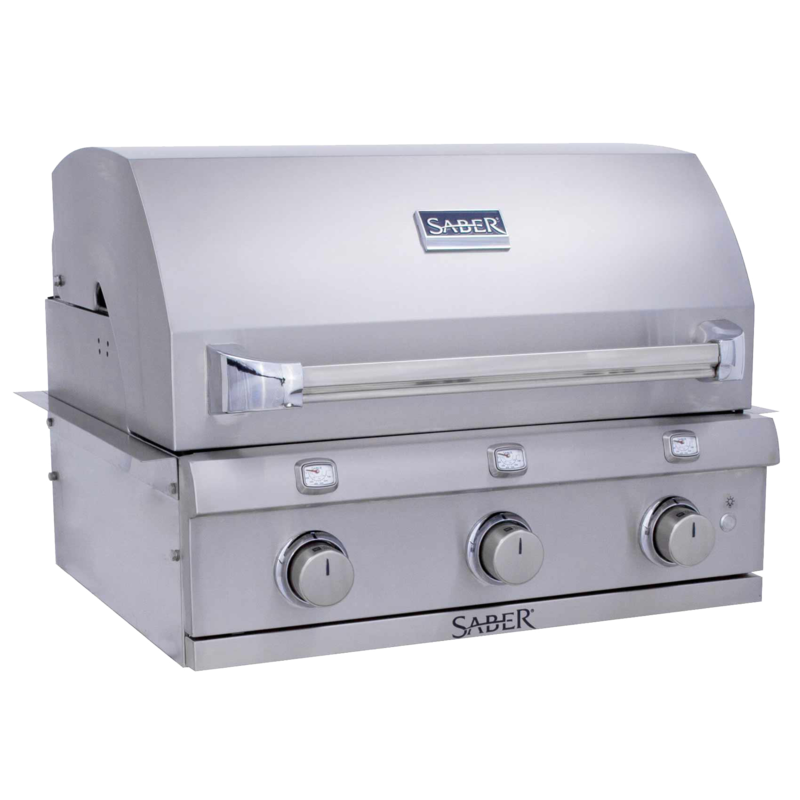 Enjoy this full-feature model Saber product that features germ and heat resistance that is built to stand the test of time. 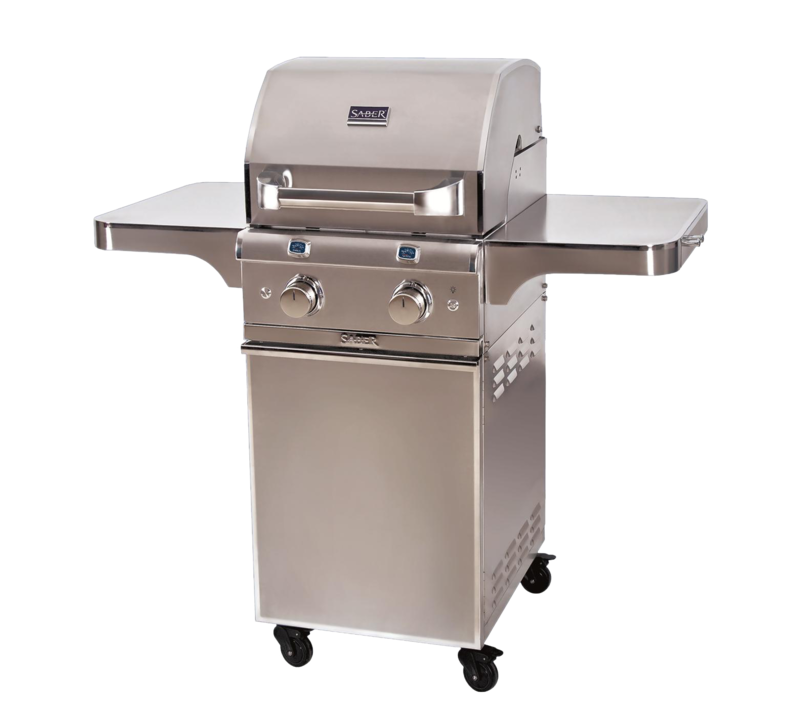 Its quality construction allows for easy cleanup, and it uses advanced infrared cooking technology for a delicious meal every time. 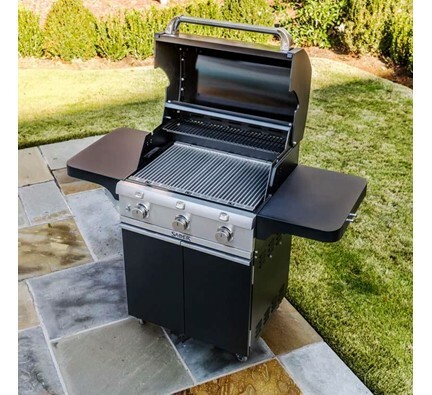 With the SABER® Cast Black Series, you can add aesthetic appeal to your next backyard BBQ with it’s black powder-coated cabinet and porcelain lid. 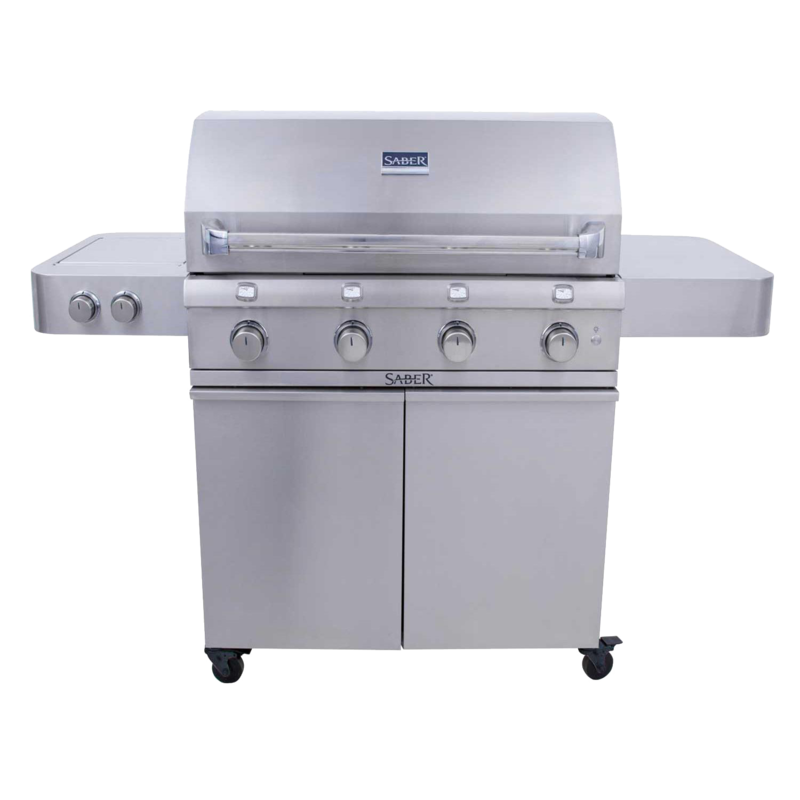 It’s ignition system is new and improved, allowing you the consistency you need in any grilling endeavor. 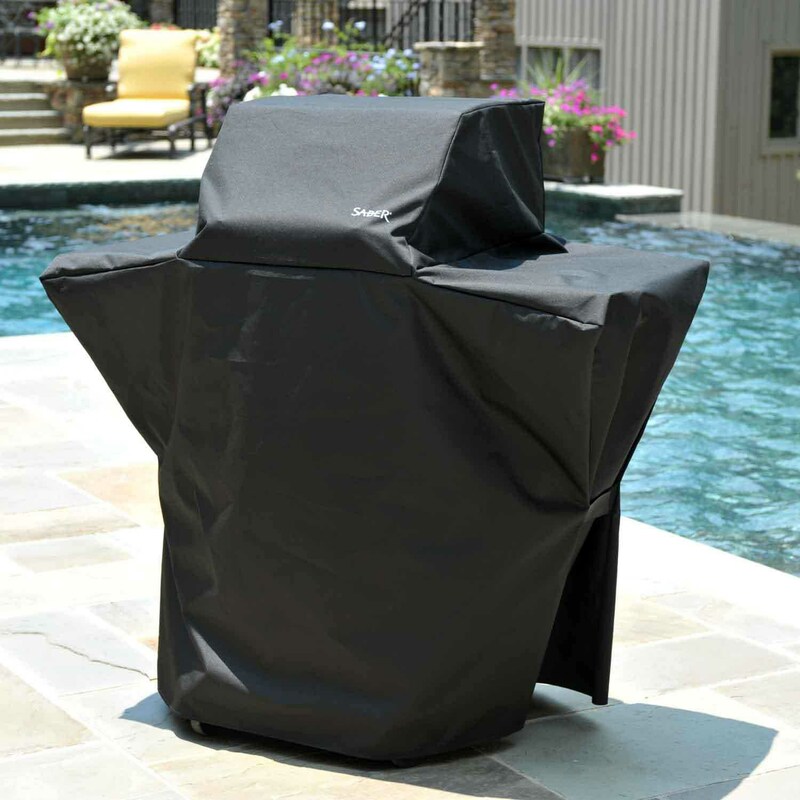 Product Dimensions (inches) 40 3/16" L x 26 1/2" W x 21 5/8"
Quality Saber Products Available at Aspen Spas of St. Louis Today! 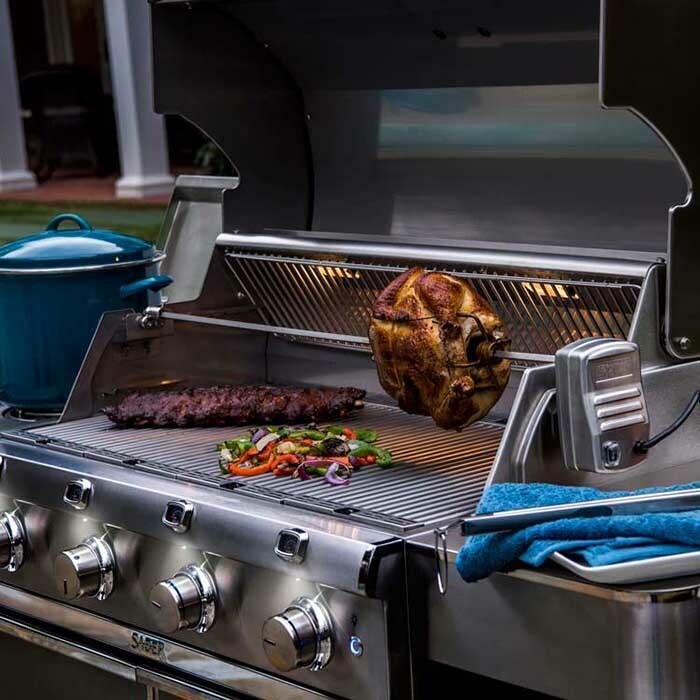 Good food is one of the true pleasures of life, and you can make the most of yours with a quality Saber product available now at Aspen Spas of St. Louis. 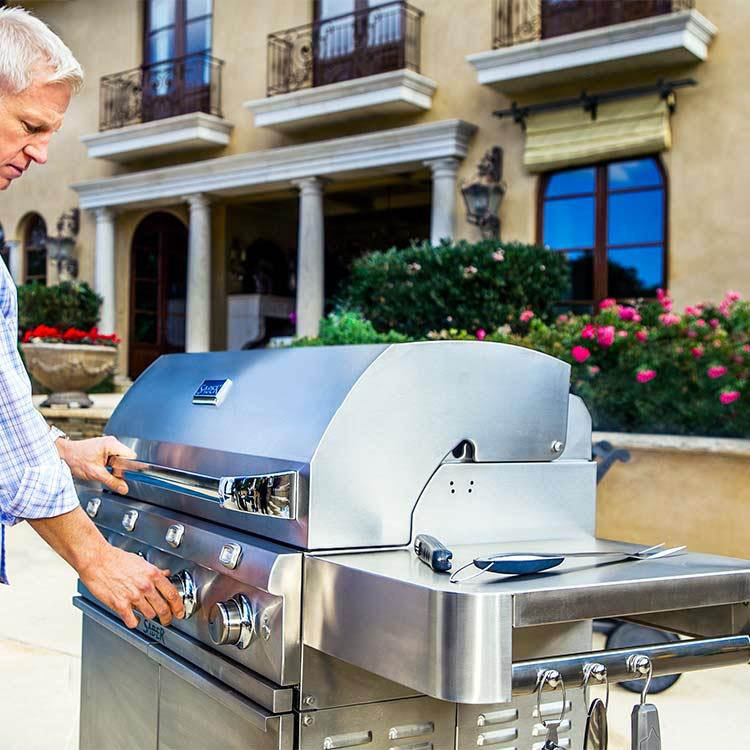 Stop by so one of our friendly associates can match you with the perfect model for your needs. 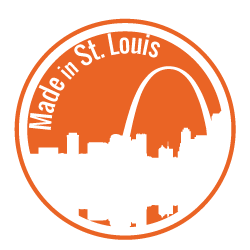 Contact us online or call us at (314) 328-6008 with any questions. 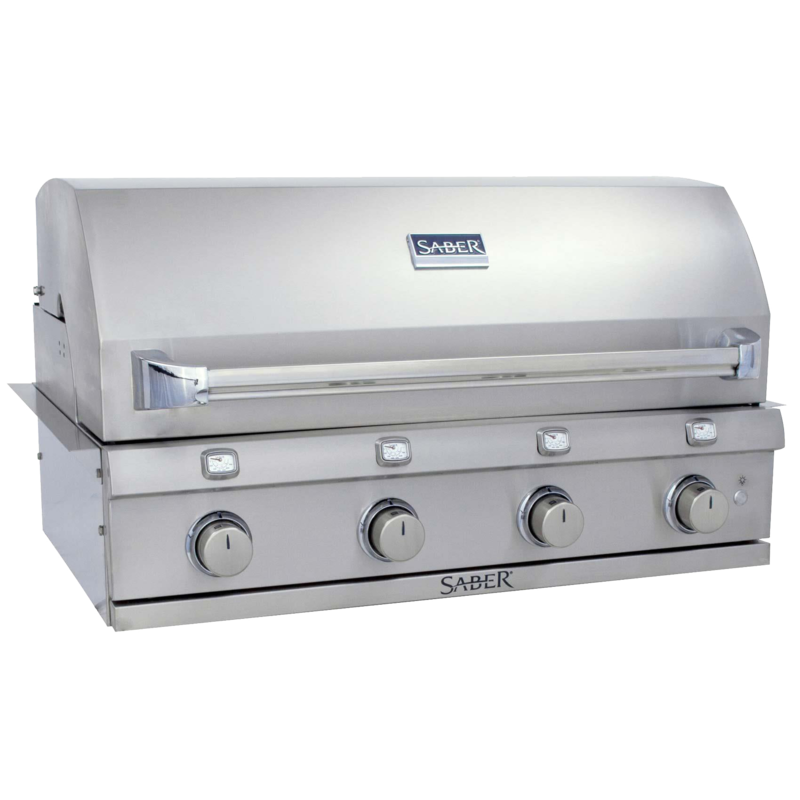 And be sure to visit their website for more information about Saber Grills.